At some point in my first or second year as a graduate student, the Spencer Research Group made a trek to Rochester to hear a talk by Senior HP Fellow Stan Williams. After some back-and-forth about the potential of nanotechnology to radically alter the development of computer chips to attain unheard of high speeds, someone in the audience piped up “Why do we need faster computers? How much faster do I need to run Word and Excel?” And this wasn’t a witty uber/1337 poking fun at bloated Windows products. This was a serious, seemingly put-off at the prospects, 60-something-suit-and-tie with, I fear, his elbow firmly on the pulse of the technology budget for his division. 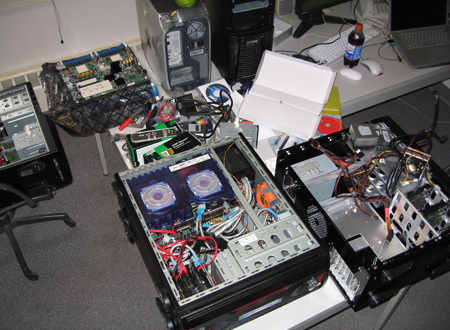 Seven years later, I’m practicing transplant surgery with motherboards too big for their cases. In case this is of use to anyone, I have been, in the last year or so, 8 for 14 on the first order for ASUS K8N-DL motherboards and 12 for 14 in total, meaning 2 sit here useless. These boards are fine once they’re made to work, but the games played with installations and store return policies are far beyond the call of duty given all other time constraints. I am hoping these problems will be remedied with the beginning of a long line of Tyan Thunder K8WE purchases, with which I’m now 2 for 2 (and discovered that now I have to worry about defective MSI video cards). And, please, never buy computer cases that come with power supplies if you intend on doing anything substantive with them (you should be fine running Excel and Word, of course). Often, you get what you pay for. Sometimes, they don’t even give you that. NOTE TO SELF: The first two crashes of the Tyan boards involved (a) the machines not waking up from their screen savers/sleep modes and (b) the SATA drives not being seen on reboot (CD drive and network boot in that order, which makes sense for a server board). The sleep mode issue was fixed without attempting diagnosis by simply turning off every and any instance of power management in the BIOS and OS. As for the SATA problem, the boot menu in the BIOS is far more extensive than I would have expected. The two SATA drives had to be added to the boot menu AND the drive with my OS on it needed to be FIRST in the boot list (Above the drive without the OS on it. So much for MBRs). If you add more than one SATA drive to the boot list and the machine still fails to boot the OS, reverse the order of the SATA list.